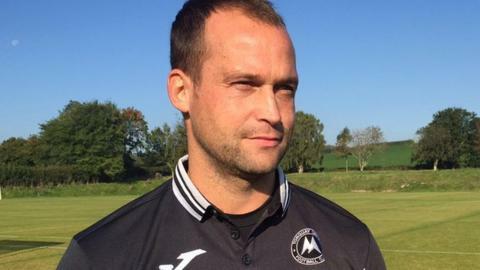 Torquay United have "no room for error" in their bid to stay in the National League, says manager Kevin Nicholson. The Gulls, who are bottom of the table and 10 points from safety, begin a run of five home games in their next seven matches when they face Chester. "Yes, we can lose a few more games and stay up, but it's about winning now," Nicholson told BBC Sport. "Early in the season you can put a couple of draws together and build on it, but we just need the wins now." He added: "There's no room for error now." The Gulls have a game in hand on all of the sides above them, but with 17 fixtures to play there is a real possibility that the club could suffer a second relegation in three seasons. Nicholson has brought in six new players since the start of January, but the club has not got a point since beating high-flying Forest Green 4-1 at Plainmoor on Boxing Day. "I've managed to manoeuvre things around as best I can," said Nicholson. "We haven't got the luxury of a pre-season to get them to bed in, they've just got to hit the ground running. "But if they do that, the beauty of having all these games so close together is that you can quickly get on a run and all of a sudden pictures can change. "On the flip side, if you get a bad result, and I'm sure there'll be one or two scattered within there, you've not got to wait long to put it right."